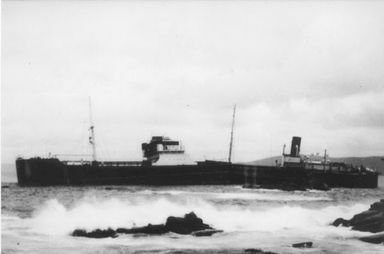 The Russian oil tanker ran aground in Pedra do Porto of Camelle on 20 August 1934. It left Leningrad en route for Batún to load crude oil. At nine o’clock at night, a loud blow accompanied by the sound of the siren alerted the people of Camelle. The rough seas and thick fog made the rescue of the 41 crew members difficult, risking the lives of the sailors in the operation. During the night 28 people on board were rescued. The captain and the rest of the crew remained in the prow and were rescued the following day. For a year it was not possible to eat fish or seafood from the Camelle coast due to the remains of hydrocarbons from the Boris. The sailors were rewarded with a special bonus for their heroic acts during the rescue. The captain M. Zikoff and the second engineer Nicolas A. Sherchov stayed in Camelle for several days to deal with the boat’s insurance. Upon his return, the captain was banished to Siberia. The Russian authorities did not understand how a boat equipped with electrical sonar succumbed in such a way.